I keep some of my favorite travel photos on my phone: A quiet temple in Kyoto, sea lions on a California beach, a bakery on a Paris street, my kids posing on a rock formation in Colorado. When people ask me where one of the photos was taken, I can't tell them much more than the basics. If they wanted to find that beach temple, I couldn't be much help. But there's a new Android app called GPS Photo Viewer that could change that. By linking Google Maps and its GPS function to your photos, the app lets you determine and enter the exact latitude and longitude for that French bakery. Google would show them the location on a map and even plot a route to get there. The app works best if you have enabled the GPS function on your phone's camera application. That makes the image's location accessible on the image's info screen. To see the app in action, watch the video below. Watch it on your computer to see description capsules. 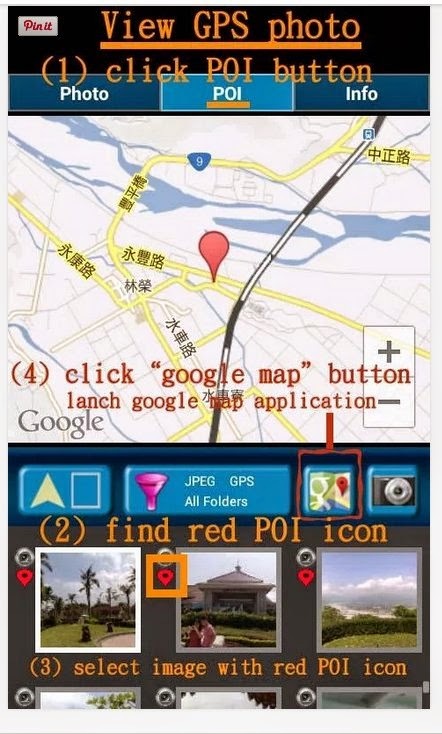 GPS Photo Viewer is free for Android users and available for download in the Google Play Store.